Update - Cody Gentry 9/10yr olds (Major Yankees) & Alex Bates (Jr. Cards) 13/14yr olds, will compete in the Team Championships on Sunday June 6th at the Oakland Coliseum prior to the A’s game. I have not heard about Jack Miller as of yet, when I do I will let you know. From the 11-12 year old division within our league, Andrew Evans (Dodgers) won the pitching competition, Jack Miller (Mets) won the hitting competition and Aaron Byrd (Rockies) won the running. 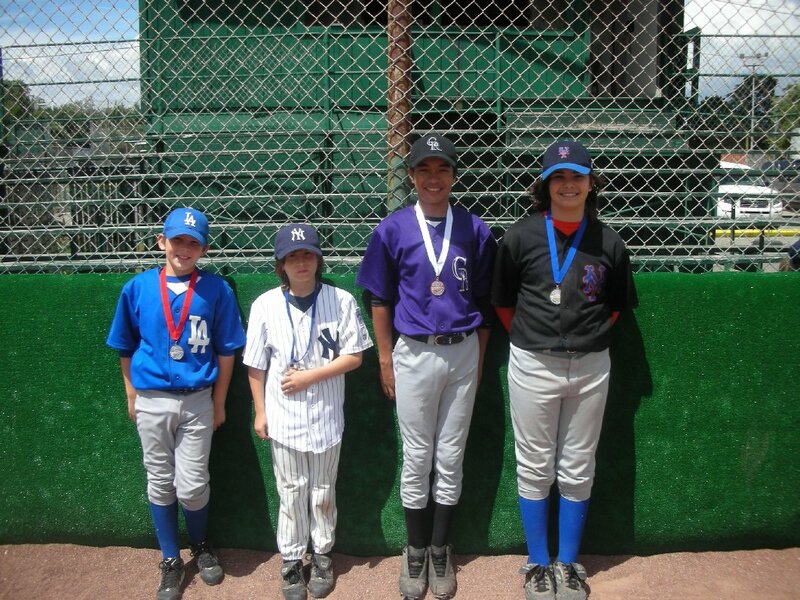 Last Sunday in the sectionals, which were held at our Galindo complex, Concord American was well represented. Jack Miller was first place overall, Andrew Evans was second, and Aaron Byrd placed third for a sweep by Concord. In the 13-14yr old division for the Sectionals, Alex Bates (Jr. Cardinals) was the overall winner & Brandon Oswald (Jr. A’s) placed 3rd. They all received medals. Also in the 9-10 division in the sectionals, Cody Gentry was overall champion.